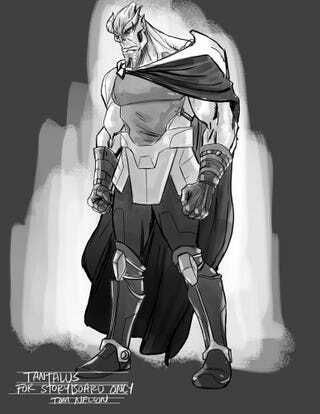 Storyboard artist for Guardians of the Galaxy has released some very, very early storyboard art from the Marvel movie, giving us a possible look at the lost character Lord Tantalus. Artist Thomas Nelson unleashed a slew of storyboard art for James Gunn's GOTG movie revealing some not-so-similar looks for our favorite band of misfits, including a new outfit for Star-Lord and Gamora. But these are storyboards; at this point in the creation of the film, things can (and did) change. Whole characters, such as Lord Tantalus (who was allegedly in an early version of GOTG), can be cut. For those not aware, LT is an alien created by a Dreaming Celestial... so maybe that's why he didn't make the cut, complicated backstory.